In my early years I was never much of a tea drinker. Not that I did not enjoy a cup here and there, but when it came to choosing a warm cup of goodness I always picked coffee. I am a HUGE coffee lover. I’ve tried to kick it to the curb on more than one occaision but the smell, the taste, it entices me, and I find myself yearning for just a sip. I have accepted my love for coffee, but I have learned to keep it to one cup in the morning. My first real experience with tea was when I worked a part time second job at a tea shop called Tea Time. It was only two days a week for a handful of hours. I made sandwhiches, washed dishes, took orders, wiped tables, and prepared cups or pots with various loose teas. I enjoyed the job, mainly because it was hardly ever busy, and because I always received a free meal with a pot of tea. For the first time in my life I tried Early Grey, and thrilled at the taste when a little splash of milk was added. One day I tried the childrens tea, gobbling up the semi melted gum ball at the bottom of the cup when all the tea was gone. I found that I really enjoyed peppermint tea, and plain green tea. Over the years I became more of a tea drinker, something I thoroughly enjoy in the evening, and even in the afternoon accompanied by a good friend. I’ve done the teavana thing, very expensive but very delicious, and my cabinet has collected quite a few boxes of randoms. It was not until I came across Rosemary Gladstar’s book Herbal Recipes for Vibrant Health that I discovered how truly healing herbal teas can be. I went to my local loose leaf tea shop, and blended my first herbal tea. A tea for insomnia. The act of mixing the required herbs, then brewing the tea before drinking was a beautiful, and fun experience. To say I loved it is an understatement. It revealed a hunger in me to learn all I could, and to continue making healing teas not just for me, but for others! I saw how this simple recipe worked for me, and I wanted to share it so others could benefit. On Valentines day I signed up for Rosemary Gladstar’s homestudy The Science and Art of Herbalism. So far I love the program. In lesson one we begin to cover the basics about determining good quality herbs, how to store your herbs to maintain quality, and where to even buy good quality herbs. When I began reading Rosemary Gladstar’s book Herbal Recipes for Vibrant Health I learned the difference between infusions and decoctions when it came to preparing your medicinal herbal teas. She covers this, and more, in lesson one. When I first gave someone a tea blend and told them to prepare it as an infusion their face scrunched in confusion. Not a lot of people know what that means, and I forget easily that until recently I didn’t even know what that meant. An infusion is when you take the fragile parts of plants and either prepare it by pouring boiling water over it, letting it steep, covered, for ten to fifteen minutes or by placing herbs in cold water, on low heat, slowly simmering, and turning it off right before the water begins to boil. A decoction is when you take the more tenacious parts of plants, like roots, bark, and nuts, and prepare it by either placing the herbs in already boiling water and simmering for fifteen or twenty minutes, or placing the herbs in cold water and slowly bring it to a boil for fifteen to twenty minutes. So what do you do when you have a premade tea that has both leafy, flowery parts as well as roots and bark? You prepare your tea as a decoction. Then when it is done you throw in a little more tea and let it infuse for ten to fifteen minutes. What some do not realize is that tea is the basis for most of herbal medicine. 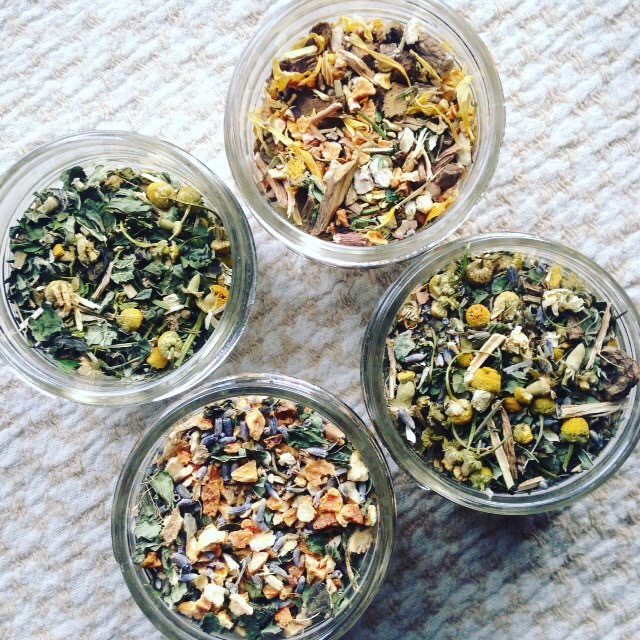 It is the primary way to enjoy herbs, and there are a variety of herbs no one has ever thought of ever drinking that could spice up a bitter, healing tea. Most medicinal herbs just do not taste good, and though you know that it is good for you, it doesn’t make it any easier to drink. Examples that Rosemary gave in lesson one for spicing up medicinal teas are chinese star anise, rosebuds, and stevia. Rosemary Gladstar wrote : Teas remind us to remain conscious of the primary role we each play in our personal wellbeing. By taking an active role in the process of the preparation of our medicines and foods, we participate in our wellness. Furthermore, tea is warming and soothing to the soul. Perhaps tonight, when you are sipping on your mug of tea, reflect on what it is you are consciously doing to better your overall wellness. Or what new step you can take for your personal wellbeing. With light and love I wish you a beautiful week. Next > When is it appropraite to not listen to your yoga teacher?